In this area journalists may find our press releases as pdf files for download. Also you are able to download pictures, graphs etc. 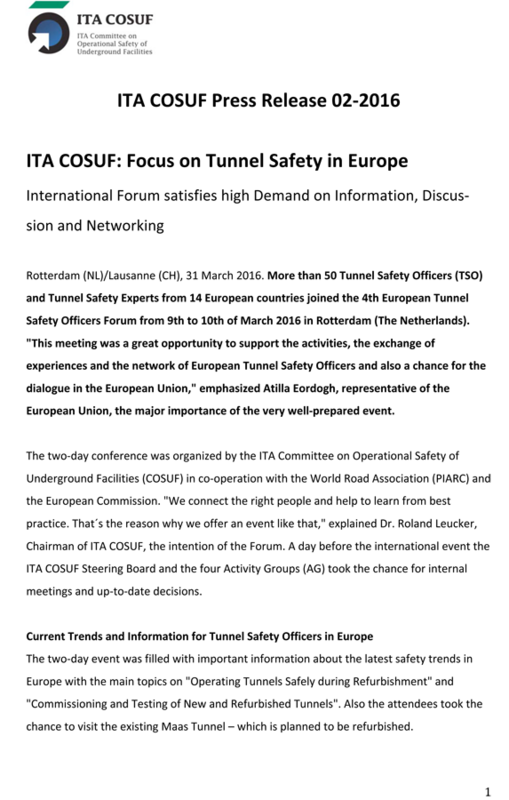 in low and high resolution for publication. Please send all printed articles, pictures or in your media used information to our press officer or secretary general. If you have any question, don ́t hesitate to contact us. Lausanne (CH), 20 April 2017. New threats like terrorist acts in tunnels and cyber-attacks to control systems could severely influence the public life. Within a workshop on "New Security Challenges for Design and Operation", ITA-COSUF will investigate how these risks can be mitigated already in the design process. The workshop will be held in Bergen, Norway on 13th of June 2017 and is an integral part of World Tunnel Congress (WTC). The workshop will include a site visit to new Traffic Control Center of Bergen. Security aspects in the design and operation of underground facilities have become increasing important in recent years. Most underground facilities are directly linked to public transport or to critical goods transportation networks. As their importance for the society makes them potential for new security threats, there is a need of new knowledge by designers and operators how these threats should be assessed and mitigated. 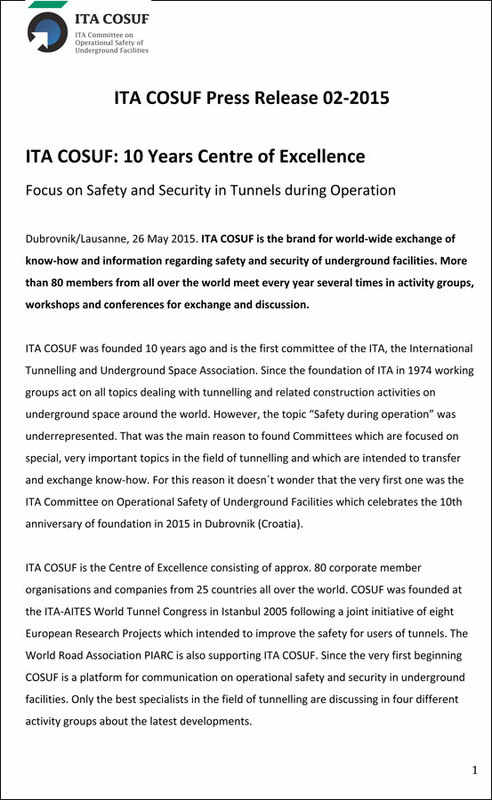 The ITA-COSUF workshop tries to identify some critical aspects how new security challenges could be taken account when designing or operating underground facilities. The presentations will be given by internationally leading experts and the workshop will be divided to two parts, “Case studies” and “Hazard identification”. The case studies will include presentations about how different threats for the underground facilities can be identified and what is the impact of human factors in case of disaster and terror. The hazard identification part will tackle topics like assessing the impact of hazardous goods in tunnels and what is the impact of explosions to the tunnel structure. 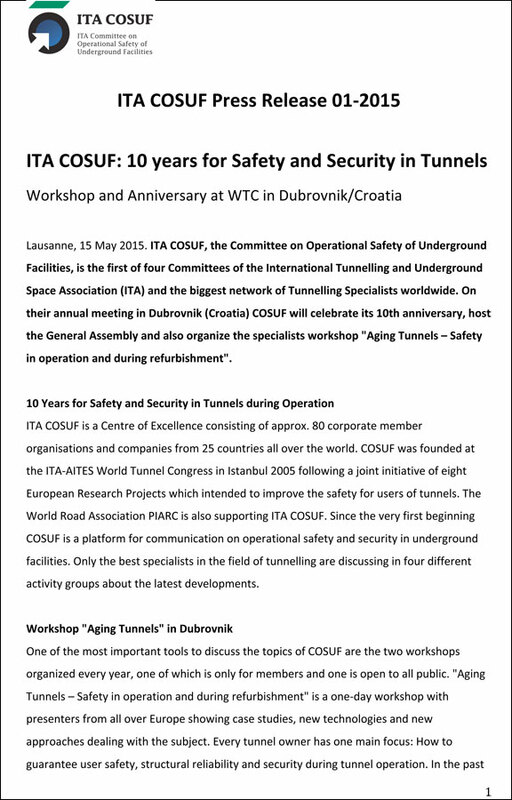 The importance of cyber security of tunnel control centers will also be presented. A technical site visit to the new Traffic Control Centre in Bergen is organised for the ITA-COSUF workshop participants. The recently opened control center includes the latest control technology and operates more than 260 road tunnels on the west coast of Norway. 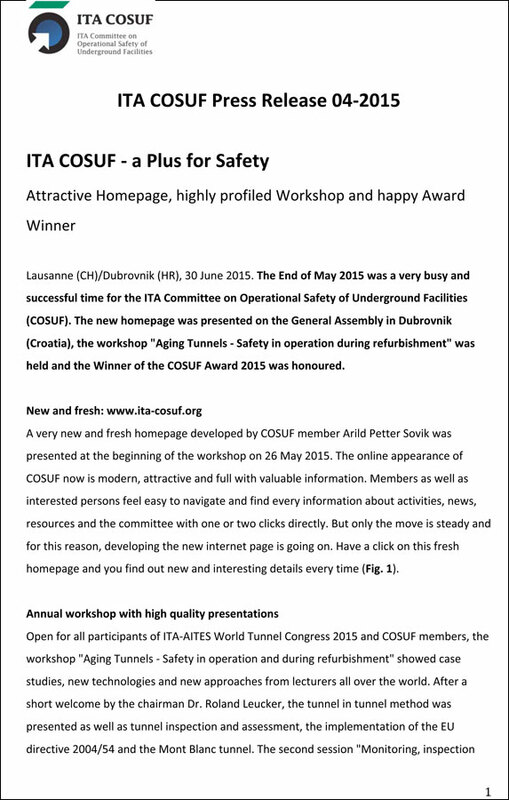 ITA-COSUF will organise transportation to the control center after the workshop. ITA-COSUF workshop is scheduled 14:00-17:00 on the 13th of June 2017 after ITA-COSUF activity group meetings. The site visit is organised directly after the workshop. The workhop will be held in the Grieg Hall Conference Centre, Bergen, Norway. Helsinki (FI)/Lausanne (CH), 21 December 2016. 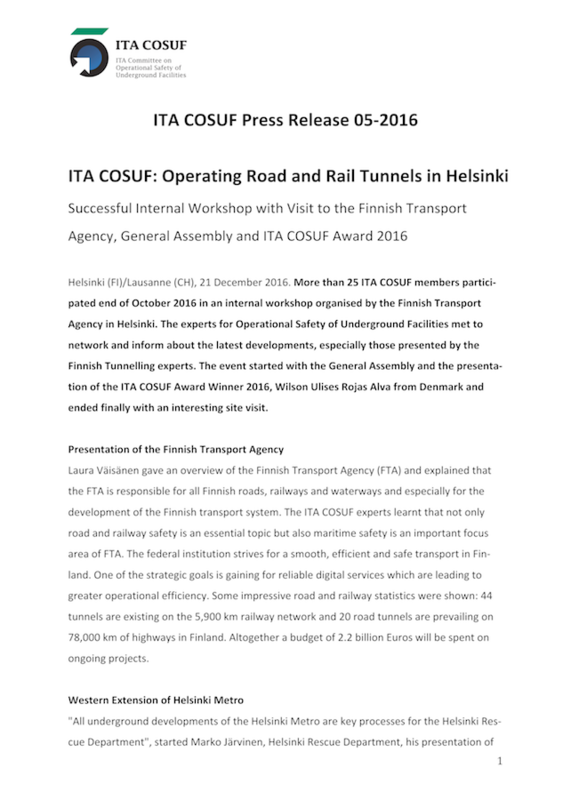 More than 25 ITA COSUF members partici­pated end of October 2016 in an internal workshop organised by the Finnish Transport Agency in Helsinki. 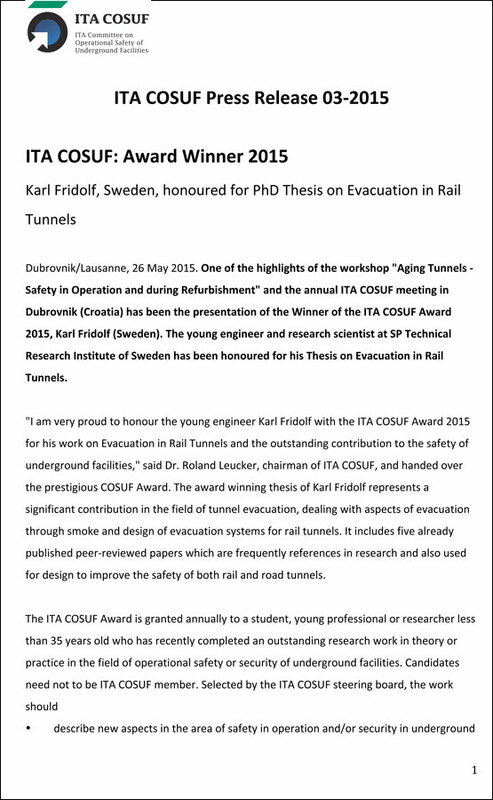 The experts for Operational Safety of Underground Facilities met to network and inform about the latest developments, especially those presented by the Finnish Tunnelling experts. The event started with the General Assembly and the presenta­tion of the ITA COSUF Award Winner 2016, Wilson Ulises Rojas Alva from Denmark and ended finally with an interesting site visit. Lausanne (CH), 5 September 2016. 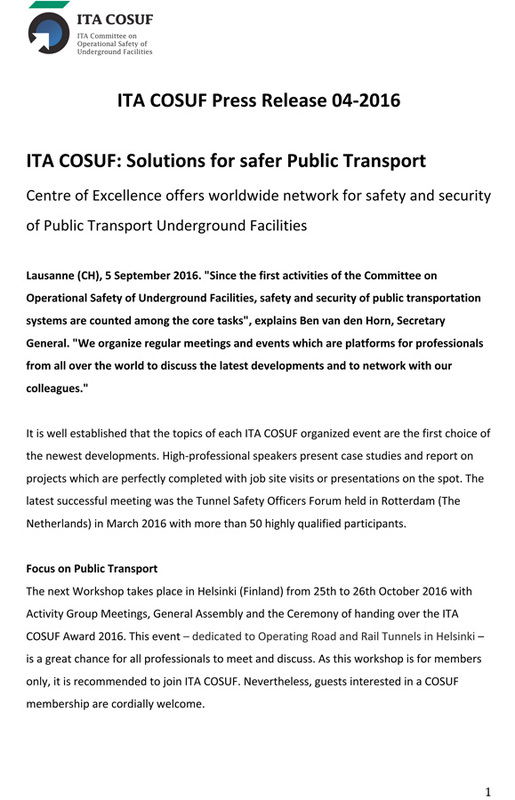 "Since the first activities of the Committee on Operational Safety of Underground Facilities, safety and security of public transportation systems are counted among the core tasks", explains Ben van den Horn, Secretary General. "We organize regular meetings and events which are platforms for professionals from all over the world to discuss the latest developments and to network with our colleagues."